During World War 2 North American aviation had it made. It was busy cranking out T-6 trainers, P-51 Mustang, and B-25 Mitchells. All of them were superbly built and able to withstand a lot of damage and rough handling. The quality of construction is apparent when you look at the warbird community and see how many of these are still flying. It doesn't hurt that they were used for decades after the war not only by the US but by many countries around the world. The T-6 is probably the most recognized trainer in the world. Literally tens of thousands of pilots learned to fly in this rather peppy aircraft, not only during the war but for years after. Even into the 1980s, the T-6 was being flown daily by military pilots. 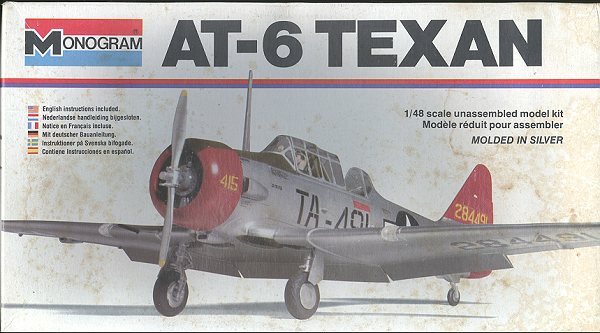 The AT-6 was an advanced trainer during the war. In this plane the pilot learned the basics of gunnery and of aircraft handling. It was also used for basic bombing and was able to provide realistic training for rear seat gunners when a rear machine gun was installed. The T-6 was also used by combat units as a general hack and for reconnaissance, especially early in the war. This boxing is molded in silver plastic. The amount of detailing in the kit is quite good, especially when you consider its age. As was common at the time, panel lines are raised and fabric representation a bit overstated, but otherwise it is a superb model. This one has its share of ejector pin marks on the smaller pieces and a bit of flash as this was the 1979 boxing (which also accounts for the box's rather disreputable appearance). The interior is quite complete with seats, sticks and instrument panels. You also get a full interior framework and the option to add the rear gun if you wish. 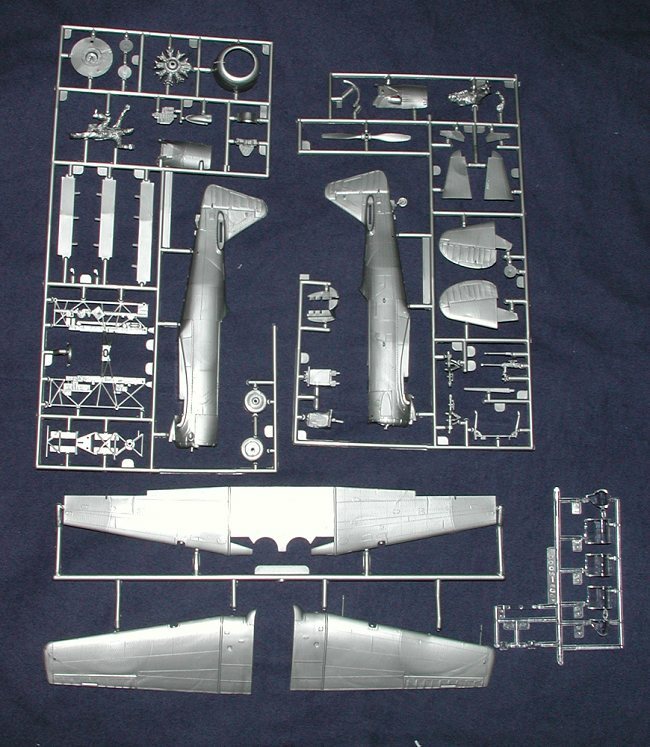 This framework then fits inside the fuselage, which also has detail on the inside walls. Two engine upper cowlings are provided, one with and one without a machine gun. The Pratt and Whitney radial is well represented. Another option is that of extentende wing and center section flaps. In fact, to do them up will require a touch of surgury on the mounting pins. The canopy can also be posed in various open or closed modes should you wish. To cap things off, there are two figures included, something that one rarely sees in today's models. 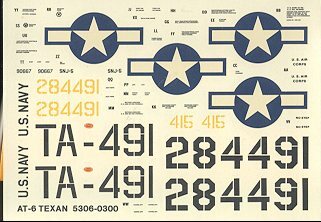 Decals are for two aircraft, both in overall natural metal. The AT-6 has a red cowling and fin/rudder, while the Navy SNJ is overall metal with no really interesting markings. There are several aftermarket sheet covering the T-6 and those should be sought out to make your T-6 a bit more interesting. Instruction sheet is very well done as are all Monogram sheets, giving appropriate color callouts throughout the construction process. Downside is that the colors are all generic and not tied into any FS 595 standard. Overall a very good kit even in today's market. For a peek at a built version, go here. If you would like your product reviewed fairly and quickly by a site that has over 1,800 visits a day, please contact me or see other details in the Note to Contributors.